It was like a most beautiful dream. Florencia en el Amazonas, with music by Daniel Catán and libretto by Marcela Fuentes-Berain came into being when Houston Grand Opera director David Gockley asked Catán to produce an opera that celebrated the “artistic, musical, and visual aspects of Latin America” as well as to create “the most beautiful opera in the last 50 years.” After seeing Boston University Opera Institute’s production at the BU Theater on Thursday I can offer an assessment: mission accomplished! Much has been written comparing Catán’s music with mainstream composers, notably the impressionistic palette of Ravel and Debussy, Stravinsky for the orchestration, and Puccini for the expansive, soaring vocal lines. I hear also a voice all his own. The production, in the capable hands of veteran director Nic Muni, seems to highlight the Puccini comparison. The similarity of Catán’s heroine Florencia Grimaldi to Floria Tosca may be coincidence, but Muni chose to build a fascinating live backdrop of actors as various Puccini heroines—Turandot, Butterfly, Manon, Suor Angelica, Mimi and Minnie—who, dressed in their recognizable all-white costumes, accompany the celebrated diva on her journey. The curtains open with Grimaldi dressed in bright-red Tosca garb, center stage with her back to us, arms outstretched to receive the adoration of her fans. Sparkling music comes from the orchestra and the chorus audience shouts and sings their adulation, but we notice immediately trombone slides in the orchestra and realize this audience is applauding in slow motion. We then encounter the “strange creature” Riolobo, as the program describes him, who hands her a bouquet of white roses in which she finds an unusual flower native to her Amazon homeland. Immediately noticeable is Riolobo’s blue tribal face paint, above his tails and white tie: we have entered the dream, and are now within an operatic journey of magical realism. The story at its top level tells of an aging diva who embarks on this steamboat journey down the Amazon, returning to her homeland to sing for the first time but essentially looking for her long-lost lover. We cannot be sure if Riolobo is real when he first appears because it is he who seems the catalyst for her thoughts and the impetus to begin the journey. Indeed, he reminds us of a commedia dell’arte character, using gestures and movements to suggest being the puppeteer. He takes charge of each of the characters, willing all of them to go on this metaphysical journey of introspection. But the music changes and suddenly Riolobo is cavorting around the stage of La Scala doing a tribal dance, still with brightly painted face. The lighting changes too and the screen, which reflected the view from La Scala’s stage, suddenly modulates to a brilliant Amazonian blue. 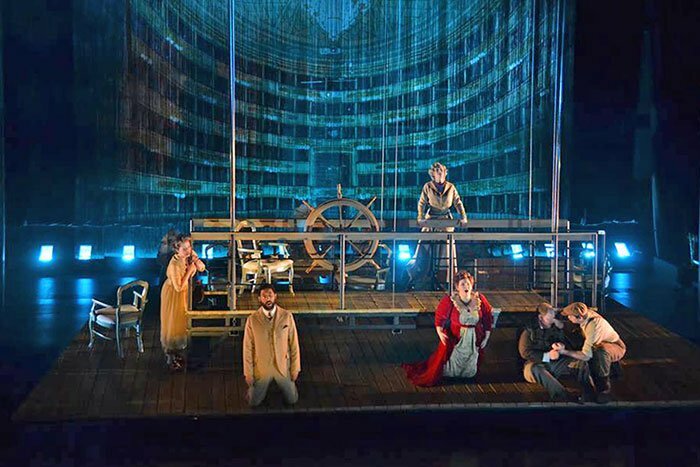 With a fly-in platform from above, we complete the picture, with a captain at the ship’s wheel as the chorus disappears and the main characters come onstage ready to board. The blue morphs to undulating water and we are on our way. Brilliant colors and images both static and moving continue throughout to fill in the thought processes of the characters; the scrims for the images projection are also able to split or be moved together to cover a larger space. If you are looking for a Puccini storyline to go with those soaring lines, you will be disappointed; this is not that kind of work. A veteran operagoer acquaintance wanted more of a story; when I spoke with Muni he told me that was the very thing he found difficult about this work. The libretto is not “action-oriented,” so he worked very hard with the singers, “digging deep” to find that true action. It is a challenge with young singers, but they rose to it; the maturity was at an extraordinary level, for subjects big and personal. Many are the stories within the main one. We had a look at Arcadio, nephew of the captain and shipmate who sings about not wanting to be a captain like his uncle, his father, and his grandfather before that. The young journalist Rosalba, with whom Arcadio falls in love, shuns him because the purpose of her life has been research and composition of a book on the Diva Grimaldi. Rosalba cannot see that the diva is right before her, taking the journey with her, and she feels she must forswear love as Grimaldi did. An older couple bickers, having taken this trip to rekindle lost love and affections, and of course we have Grimaldi herself, who, while going through all the inwardness, seems also to be watching these other dramas unfold. Comic relief is provided by the elderly couple squabbling over menu choices. The libretto, penned by Marcela Fuentes-Berain (chosen by Márquez for this project, and in attendance, along with Catán’s widow), is, frankly, a work of genius. Even reading subtitle translations I was moved to tears at times by the poetry, the intimacy Fuentes-Berain shared with the images she was describing. In paraphrase, she spoke of the river winding within edges like the wounds of love. Imagery like this was sometimes so beautifully translated as to make a lazy student of Spanish contemplate how powerful its magnificence is in the original. Florencia en el Amazonas is a challenge for young voices, being Wagnerian in scope with vocal lines over lush orchestration that seem to never end. Catán artfully devised a reduced orchestration that retained his intended lush effect. The lines are punishingly high, in particular for the tenor Arcadio and the sopranos Grimaldi and Rosalba (Sara Alvaro). There were times I wished for a falsetto from tenor Heejae Kim, and at last heard one in the second act, which was surprising, as there were missed opportunities earlier. Because the piece is so unrelenting in its passionate outpouring of voice, one must take every opportunity to color the words and step back occasionally with a softer sound to give the ear a rest. Kelley Hollis (Florencia) has a big beautiful voice and did a brilliant job with the part both dramatically and vocally, looking every bit the polished performer. But still I would love to have seen and heard more color in her acting and singing. Bass Jorgeandrés Camargo was a convincing ship captain and baritone Erik Van Heyningen had a wonderful understanding of how to play the elder gentleman Alvaro. His partner, mezzo Stephanie Zuluaga (Paula), did not stand out to me much, until she came down and delivered a notably affecting aria toward the end. Feeling she has lost her husband forever (washed overboard during the storm), she used the vocal shading, coloring of words and expression I had been waiting all evening to hear from someone. Baritone Isaac Bray as Riolobo was well at ease both vocally and dramatically, and cast perfectly for this role. Conductor William Lumpkin did a marvelous job keeping his forces in hand, presiding over a professional-sounding pit orchestra of 45 complete with prominent marimba and the occasional native-sounding percussion. He elicited luscious string textures, and there were only a few instances when the voices seemed to compete, mainly in chirpy Stravinsky-like wind passages. This competing is not easy to solve, and would have been less problematic had there been a deeper pit. The chorus, which began onstage as audience, filed off to sing offstage, eventually ending up in the balcony, to wonderful effect as their sound washed over our heads. The scenic design of Courtney Nelson, lighting design of Brandon Bagwell and projection design of Matthew Haber also showed brilliance, and to complete the magic were the costume designs of Katheryn Schondek, whose cool palettes never competed with the dazzling colors of the projections. Daniel Catán’s shimmering, powerful and often complex music, reminiscent of Respighi, Puccini, Strauss, and Ravel, was ably performed by the orchestra composed of BU School of Music students under the magical baton of William Lumpkin. His conception extended to Sunday afternoon’s stellar cast that gloriously sang out this music with fervor, filling many of us with emotions we sometimes forget we have. 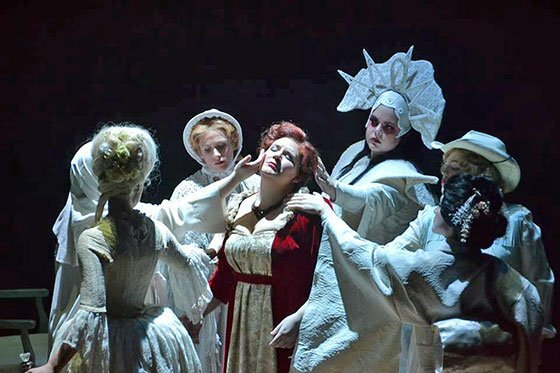 Singing the title role, Kasey King’s soprano was fiery and rich, commanding the top notes demanded by the composer. Baritone, Nickoli Strommer, who played Riolobo, was an audience favorite as a mythical river god with rock star attitude. Lovers Arcadio and Rosalba, sung by tenor Christopher Hutchinson, and soprano Katrina Galba, formed a dramatic and vocal powerhouse with tremendous dynamic range. 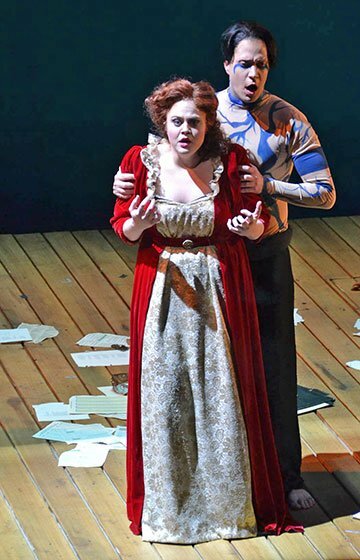 Billed as “an older couple,” Paula and Alvaro, sung by Bethany Hickman and Benjamin Taylor were dead on with their subtle shadings and vocal hues. Jack Rabin as Capitán has a fine bass-baritone but somewhat thin in the lower register. The only disappointing aspect of the production was the pronunciation; it sounded like Americans singing poorly-coached Spanish with Italian accents. This was a point future Spanish language productions should take more seriously, especially when just about every other aspect of the production was truly superb. I was incredibly moved by all aspects of this production, having witnessed and participated in the remarkable growth of BU’s Opera Institute over the years as its Director. Now playing a new “supporting role” as voice teacher, I am none the less proud and delighted to note even more innovation in production design, a continuing superior level of teaching and training in voice, opera, and theater which integrated in this moment. Thank you Boston Intelligencer for providing intelligent, positive critical feedback, when other sources (Globe, Phoenix) have sadly fallen away. And thank you Boston University for supporting the performing arts! Sharon Daniels, former Opera Institute director of BU Opera Institute, has written a gracious and beautiful response. Brava, Sharon!